New development along Miami’s Biscayne Boulevard. Courtesy of Duany Plater-Zyberk & Company and City of Miami Planning Department. On February 9, Elizabeth Plater-Zyberk, the grande dame of New Urbanism, will present Miami 21, the first New Urbanist zoning code to be adopted by a major American city, at the AIA Center for Architecture in New York. Written by Plater-Zyberk, this form-based code was approved by the City of Miami in 2009. Miami has officially been New Urbanist—a theoretical Seaside on steroids—for the last three years. As mapped out by Miami 21, the citywide transformation away from automobiles and air-conditioned bubbles will take decades and will depend on Miami’s traditional boom-and-bust cycle of growth to accomplish this massive undertaking. It is an imperfect experiment with significant obstacles for the city, but there’s little doubt that it will work, and that it already has. New Urbanism was born in Miami, at the hands of the city-planning duo Ms. Plater-Zyberk and her husband Andres Duany, and preached to the world by way of the University of Miami School of Architecture, where she is dean. Duany Plater-Zyberk’s (DPZ) most famous works of New Urbanism are out of town, but their presence in the city has always been felt to some extent. 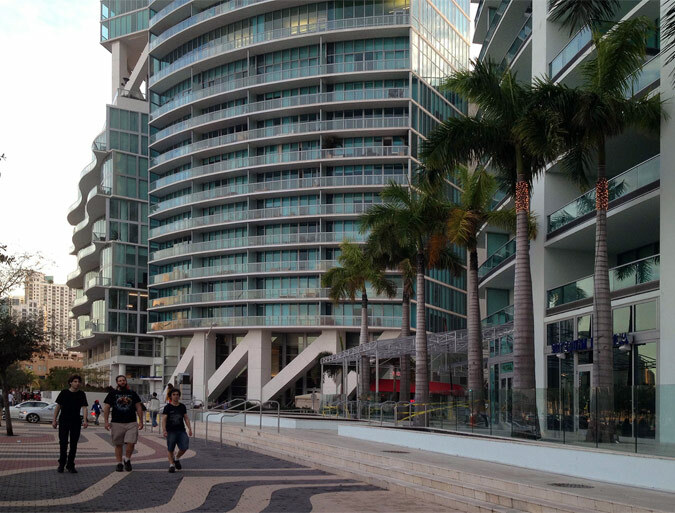 DPZ designed the island community of Aqua in Miami Beach, and master planned some of the city’s older areas. New Urbanism-esque projects appeared by other architects as well, including the Midtown Miami development, CocoWalk, and Mary Brickell Village. Most were malls trying to function like cities, to varying degrees of success and abject failure. But while New Urbanism was achieving its early victories in Seaside and other picture-perfect small towns in the middle of nowhere, it gave us the reasons why our old pedestrian areas—places that never quite gave way to the car simply because many tourists come without one—worked so well. South Beach and Coconut Grove were still great for the same reasons they’d always been. And now they were seen as prototypes for the future city. Miami 21 challenges New Urbanism’s suburban reputation and tests its effectiveness on the scale of a real city. South Florida seems to have finally developed an urban passion, a desire for civic beauty–just in time for Miami 21 and exemplified by such projects as Grand Central Park, an unlikely case of a nightclub owner founding a nonprofit organization for the creation of a park on leased land across the street from his venue. Enthusiasm for the park’s long-term success is high; with its great access to mass transit and proximity to downtown, and massive new developments expected nearby, it puts a particularly urban twist on New Urbanism. A few blocks away from Grand Central Park, Biscayne Boulevard, one of Miami’s principal streets, was given an early taste and test of Miami 21, years before the rest of the city. 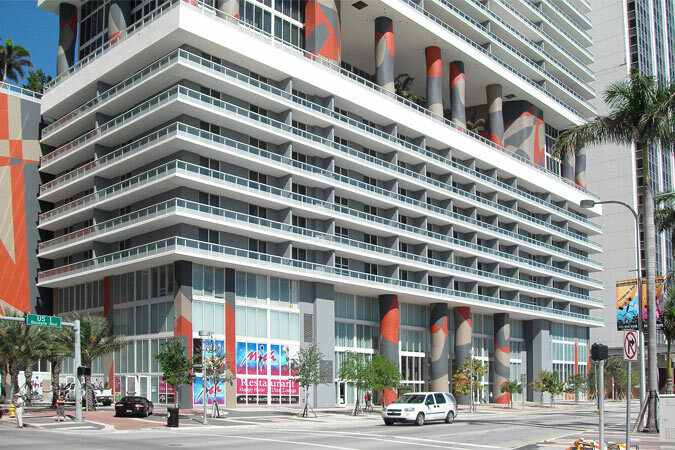 By negotiating with developers of a series of new condo towers being built during the last boom on the strip, planners were able to steer redevelopment, creating a new pedestrian district in Miami in a matter of years. The Boulevard’s transformation is far from complete. Here you see a thoroughfare halfway through a seismic shift, leading a city with even farther to go. Condo towers shot up, with parking garages concealed behind live/work spaces, double-height lofts, and street level retail, often shaded under sidewalk arcades. Porte cocheres are gone, and lobby entrances are now primarily pedestrian. Biscayne Boulevard is still a mishmash, with plenty of older auto-oriented buildings and some vacant lots disrupting the continuity. Density, although high where the towers are, is still spotty. And if you’re going any farther than a few blocks, driving is still the easiest choice. Since each building sits on a massive garage, parking is readily available. Therein lies one of the ironies of Miami 21. The code is not complete. Miami 21 is stymied by the fact that it is not a code for a complete city, but only for its zoning. Miami’s lack of quality mass transit is one of the city’s worst obstacles to growth, and yet transportation planning was firmly beyond their jurisdiction. The long battle to enact the code also led to compromises and conformity on such matters as parking requirements. Although made far less obtrusive and visible in the Miami 21 code—by hiding them behind a layer of residential, retail, or other uses, and limiting driveways of single family houses to the width of one car—parking garages face no actual reduction in required capacity from the previous code. Transportation, whether by car, Metrorail (Miami’s subways are elevated, because a high water table makes tunneling problematic), or bus, is an unresolved issue for Miami 21. Density and walkability require mass transit, and there is substantial public support for rail expansion in Miami, but mismanagement and cost increases have practically halted the transit system’s growth. It seems that city planners are not active enough in pushing people away from cars or toward anything else. If the city is going to lessen its dependency on private cars, the Metrorail must be massively expanded, and travel times must improve. A new rail spur, off the single Metrorail line, is now connecting Miami’s downtown with the airport and adding commuter rail to the Florida East Coast (FEC) tracks has been debated for the last ten years, but Miami’s lack of a coordinated plan to improve mass transit is a critical flaw in its development and probably the biggest threat to Miami 21’s citywide success. Complete New Urbanism includes good mass transit. Miami 21 does not. The Miami Marlins ballpark is a new iconic–and huge–public building that doesn’t live up to Miami 21. Opening this year, it is a jumbo palazzo that is dripping in the kind of flashy luxury common in Miami (a private box behind the bullpen has a swimming pool, for the right price) but is practically hostile to its urban context. Metrorail is more than a mile away, parking garages loom ominously over neighborhood streets, and the building is out of scale and context with its low-density working-class neighborhood. The strength of Miami 21 is not in big moves, like rail lines, or iconic public buildings. Miami 21’s power is urban infill, density, and the vitality of the pedestrian experience at the neighborhood level. Whether or not you can take the train to get across town, you’ll be able to walk to get groceries, run an errand, enjoy the company of other people, or, invoking a South Florida cliché, to have a Cuban coffee and pastelito. The strength of Miami 21 is in human things, like the Publix grocery store under construction at the new towers on Biscayne Boulevard. A cafe and other retail add a variety of sidewalk amenities, and the parking is on the roof. The last big building boom ended a few years ago, but Miami is about to have a second act. Between now and 2020 the city of Miami will probably change tremendously. A new elevated rail line will connect downtown with the airport, Amtrak, and commuter rail. The old FEC tracks, which pass through the heart of the city, may finally be restored to passenger service. New parks, including Grand Central Park, Museum Park, the Brickell Green Space, and the Flatiron Park, will open. A $600 million tunnel will connect downtown with the Port of Miami, by passing under Biscayne Bay and the port’s main shipping channel. And $10 billion in new construction is planned within 20 blocks of downtown Miami, most likely including two mega casinos, a tower about the height of the Chrysler Building, and two major museums. In the middle of the Great Recession, Miami is entering a construction boom comparable to the condo blitz of the last decade. Much of this construction has already started, and some of it is nearing completion. Some will never happen. The storm of new construction in the city’s heart is a great thing for Miami 21, and it means we will see the effects of the code rather quickly. It’s a substantial beginning and an experiment that is nowhere near an end.